Washington, D.C. (June 1, 2018) - The National Association of Black Journalists (NABJ) has selected Beverly White, general assignment reporter at NBC Southern California/KNBC, as the recipient of the 2018 Chuck Stone Lifetime Achievement Award. The annual honor is awarded to a journalist with at least 15 years of experience and a track record of extraordinary contributions to the enrichment, understanding and advancement of black life and culture. It is named for Chuck Stone, late columnist for the Philadelphia Daily News and former Tuskegee Airman, who died in 2014. White said she was pleasantly surprised when NABJ President Sarah Glover telephoned her to tell her she'd won. "I thought she got the number wrong," White said. "I've been coming to conventions forever and I know that's a big deal. I'm floored, flummoxed, flabbergasted and deeply honored, for real." Glover explained why the organization picked the longtime broadcast journalist who also has served as a scholar-in-residence at Citrus College and adjunct professor at the University of Southern California. Tre’vell Anderson, president of NABJ – Los Angeles, said White is a local legend known for her talent and willingness to support would-be journalists and those just entering the field. “I think Beverly is the ultimate example of what a black journalist is, what a black journalist can be, and a really great person who has a great heart,” said Anderson, film reporter at the Los Angeles Times. White’s career has taken her from Hurricane Andrew to the Boston Marathon bombing. She has explored why black Cabbage Patch dolls do not sell and shined a spotlight on a little-known documentary about the legendary owner of a now-closed LGBTQ club in Los Angeles called Jewel’s Catch One. Even director/producer/screenwriter Ava DuVernay had to give White a shout out on Twitter on that one. White, a three-time past president of NABJ – Los Angeles, said she is grateful to pioneers such as Chuck Stone. White grew up in the central Texas city of Killeen, Texas, one of four children of a retired Vietnam War-era Army officer and a public school cafeteria worker. She was the first one in her household to finish college. Her family instilled in her a good work ethic, she said. ” ‘Do not be a disgrace to the race’ – it became the mantra of my parents and grandparents,” she said. At the University of Texas at Austin, an economics professor who’d worked at the Louisville Courier-Journal encouraged White to try some marketing classes, and those classes were in the same building as the journalism department. White said she was drawn to the industry because of its power to help correct racial disparities in coverage of crime and social issues. “I was just craving some inclusion – I did not see enough of us in context,” she said. 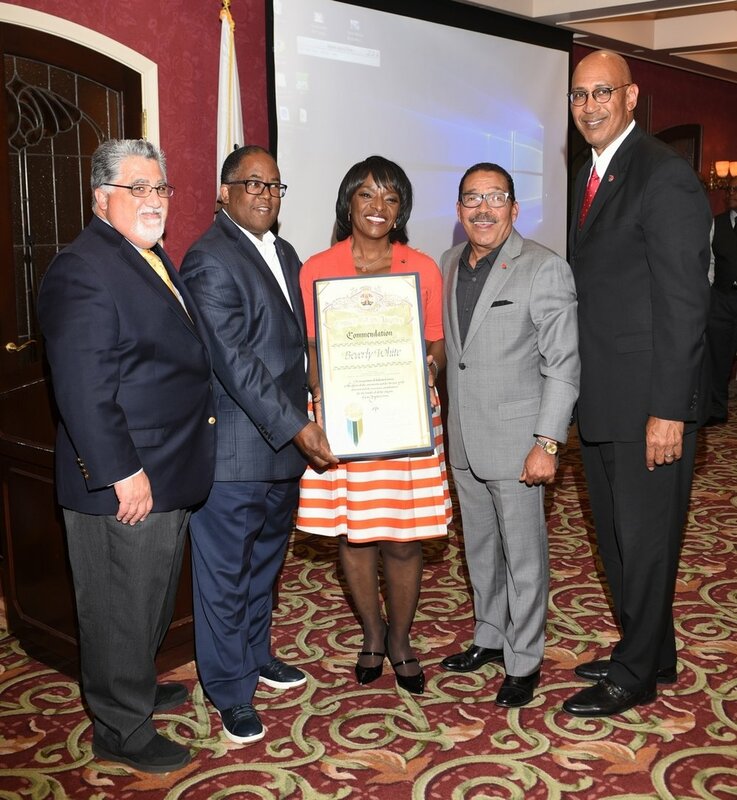 Beverly White with (left to right) California State Assemblyman Anthony Portantino, County Supervisor Mark Ridley-Thomas, President of the Los Angeles City Council Herb Wesson and State Assemblyman Chris Holden. After graduation, White began her journalism career in her native Texas at NBC affiliate KCEN-TV in Temple/Waco and KENS-TV in San Antonio, and later, worked in the Cincinnati market. In 1989, she attended the NABJ convention in New York — the setting for a meaningful career turn. There, White met a broadcast executive who brought her to NBC affiliate WTVJ in Miami, where she was part of a team that won a 1992 Peabody Award for coverage of Hurricane Andrew. That same executive later brought her to KNBC. “This organization truly changed my life,” White said of NABJ. The journalist said she is grateful that she works nights because it allows her to meet with students during the day and encourage them to enter the profession. 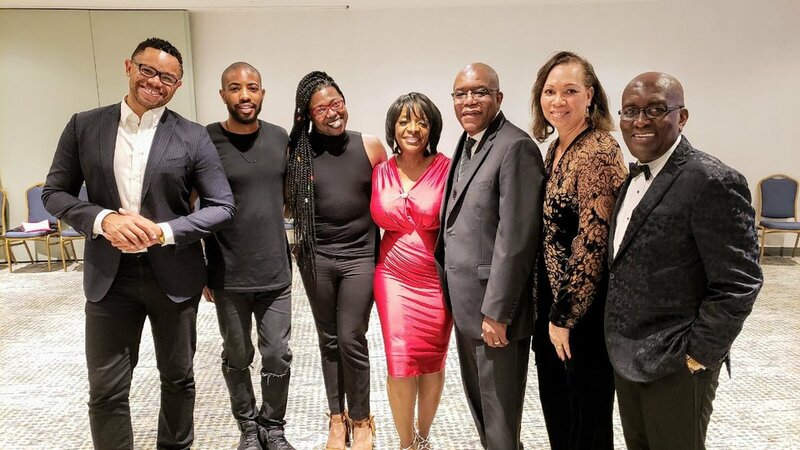 Anderson credited White with pulling him into the NABJ fold after a period where he felt isolated and was looking for ways to introduce more LGBTQ programming into the organization. “Beverly brought me in and told me that my thoughts and feelings were not only valid but that they would help charge forward a path, and she really encouraged me to get involved,” Anderson said. White lives in Los Angeles with her husband, past NABJ – President Xavier Higgs. White was honored at the NABJ Salute to Excellence Awards during the NABJ Convention and Career Fair on Saturday, Aug. 4 at the Detroit Marriott at the Renaissance Center.